With birthday festivities over and done with for another year, we put up the Christmas decorations this afternoon. 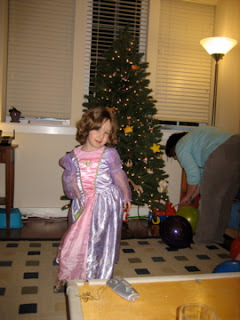 Elise is a fabulous helper, and we have a nicely decorated tree to prove it. 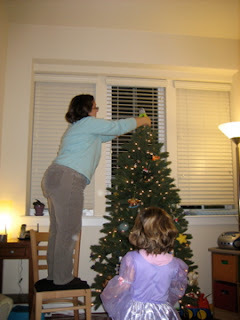 It hasn't always been so easy to put up the tree. For the past five years, we had a gorgeous but humongous tree. Nine feet tall, as big around as a VW bug. It put a real cramp in our living quarters every year. This picture from last year shows it shoved in a corner with half of the bottom branches unassembled, and it still took up the entire living room. So, a few weeks ago I sold the old tree on Craigslist to finance a new, smaller tree. The guy who bought it called after assembling it at home to say how thrilled he was, so it's nice to know it went where it is appreciated. 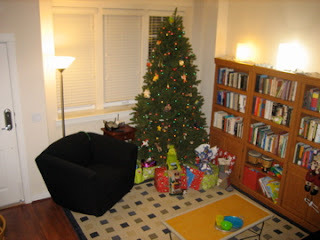 The new tree is not quite as bushy and full, but it also takes up significantly less floorspace. It is also hinged, comes in 3 manageable sections, is pre-lit, and stores in one convenient box. All in all, a better bet for us. 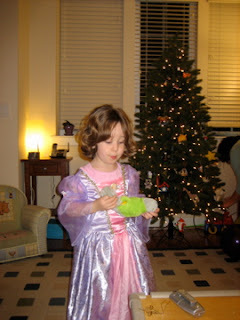 Oh yes, we have a fuzzy representation of our parrot on top of our tree ever year. The difference this year is that it takes a chair rather than a stepladder to get it up there.